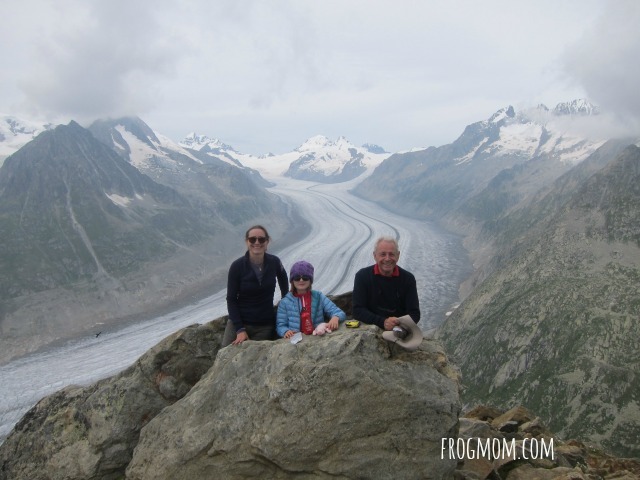 For traveling families, the Jungfrau-Aletsch World Heritage Site is a must-do in Switzerland. 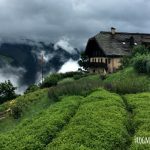 Featuring the largest glacier in Europe and Asia combined, this mountain range is easily accessible via gondolas and trains and offers some of the most beautiful high Alpine scenery with snow-capped mountains, happy marmots and bell-dangling cows. 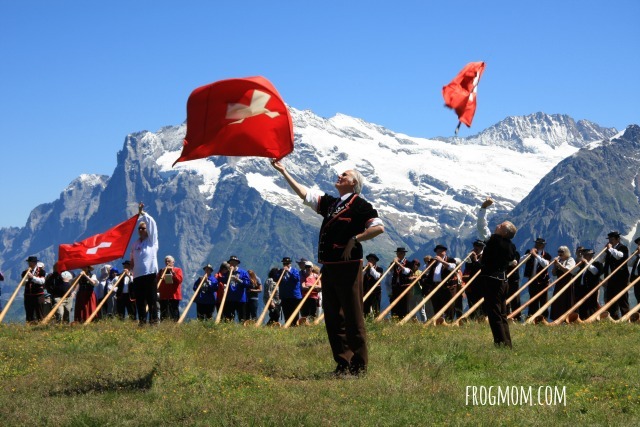 If you time it right, you can even watch a full-blown concert of Alphorns by musicians in traditional Swiss costume, a real Heidi cultural experience. Who can resist that? 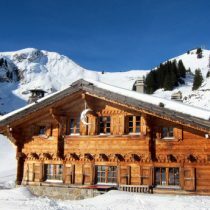 Exploring the Jungfrau-Aletsch World Heritage Site requires some planning as the site covers many valleys and mountains. 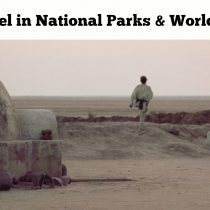 In fact, it’s taken my family two separate trips (two full days) to visit both ends of the site. 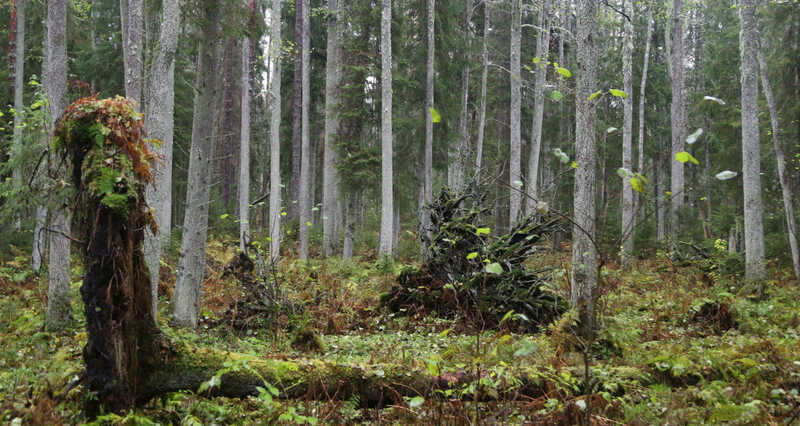 With a surface of 820 square kilometers, this park is larger than Shenandoah National Park and 2.5 times the size of Malta. That’s why it’s essential to know all quick-access points, the best budget deals and time-saving tips. 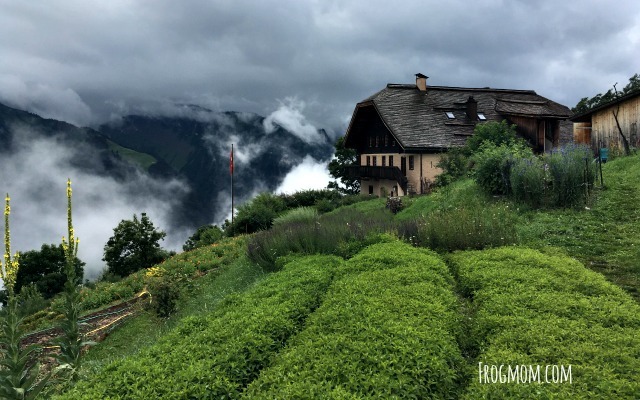 To make the most of your trip, I’m sharing this family guide to the Jungfrau-Aletsch World Heritage Site divided into two parts relating to the two mountains that give it its name–the Aletsch and the Jungfrau mountains. Aletsch was the first side of Jungfrau-Aletsch that we visited and I would have been happy with just that. It’s magnificent. Only in Alaska have we seen glaciers this close to the trail. 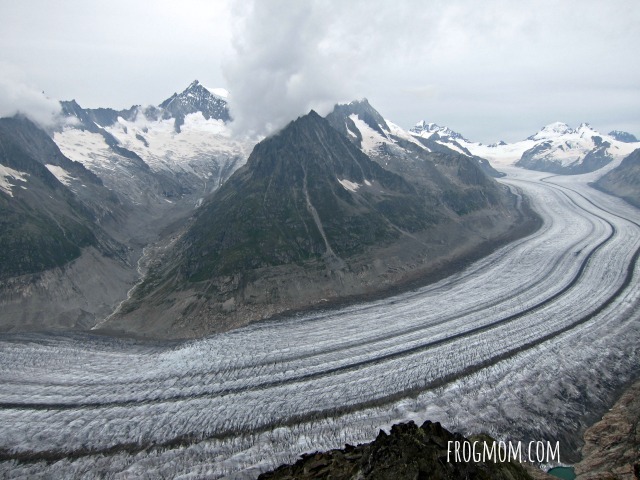 The Aletsch Glacier is one of the wonders of Europe and thanks to easy trails on the ridge, you can literally admire it from up top. 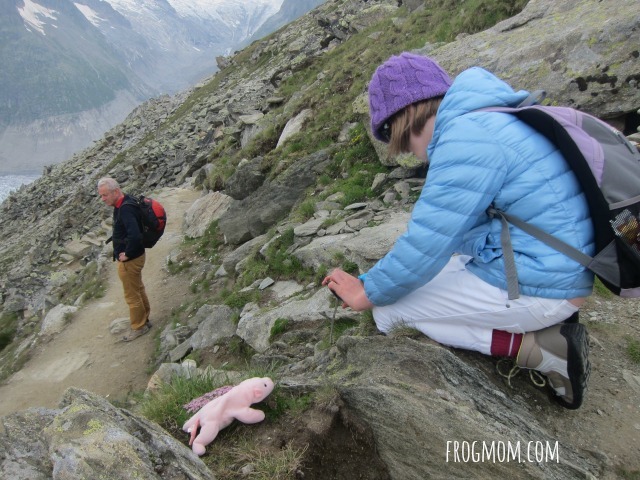 I took my (then) 8-year-old daughter (and her stuffed pig, PigLit) on an Aletsch Glacier adventure in July. Though most people view the Aletsch glacier from Jungfraujoch (the highest train station in Europe and the most expensive train ticket too), we opted for a cablecar ride from Fiesch, a much cheaper alternative with better views. 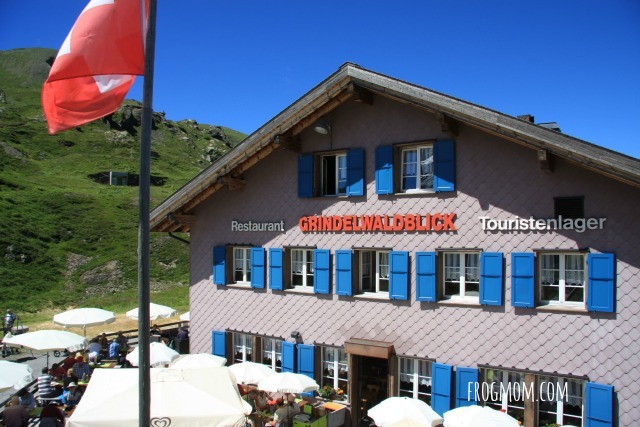 From the village of Fiesch, we rode a first cablecar to Fiescheralp (that’s mid-mountain) and transferred to a second cablecar to Bergstation Eggishorn, the highest cablecar station on the mountain at 2,869m (9,412 ft). Once we stepped out, a cold wind had us zip our jackets right away. Riding both cablecars takes you 1,800m/6,000ft above the valley floor in less than an hour, which is enough to reach glacier level and to feel like winter just came in the backdoor. Brr, you definitely need warm layers, even in summer. No wonder the most popular drink at the cablecar restaurant is hot chocolate, which is what we drank on the way out. 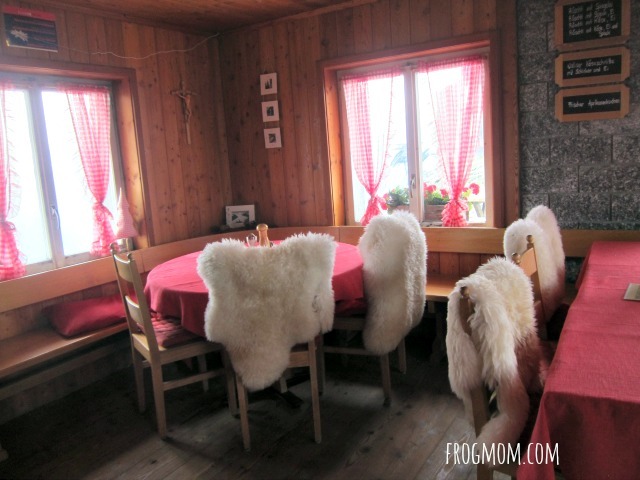 On a side note, the sheepskin and checkered red decor at the restaurant was lovely. Choosing a trail is very easy as signs provide various options with timing and we picked a trail map at the cablecar counters. As we were pressed for time (2+ hour drive home), we picked a short and easy trail, a 15-minute walk to Eggishorn for the best vista point on the glacier. Along the way, my daughter took photos of PigLit on various rocks and ate Swiss milk chocolate to enhance the experience, while my father looked on. Though the trail wasn’t very steep, we were still very happy to have good hiking shoes as it was uneven and rocky. At the top, we clambered down a few big boulders and found a larger one to sit on and watch the glacier during 30 minutes. We were amazed that it was 24 km/18 miles long and that we were only seeing a small part of it. If we had a full day, I’d like to come back and hike the UNESCO Panoramaweg to Hohbiel via the hanging bridge. That would be awesome but it’ll have to wait. Just that view was one of the highlights of our summer. 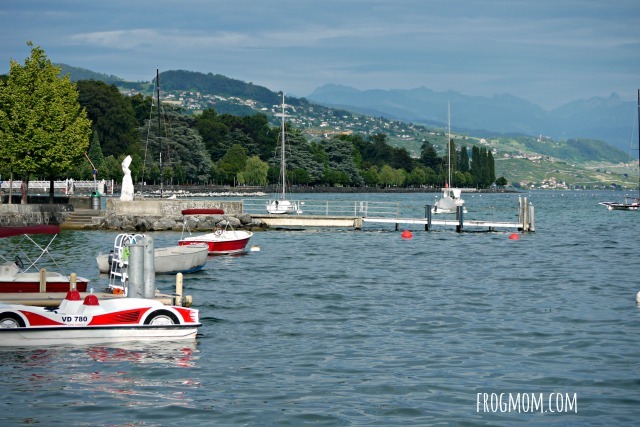 Including the 2h+ drive time from Lake Geneva, this made for a great day out in the mountains and riding the cablecar was probably my girl’s favorite part. 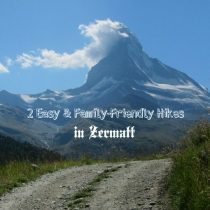 Completely on the other side of the mountain range, you can explore the famous Eiger, Mönch and Jungfrau mountains. Whereas the Aletsch glacier side is all mineral, this side is all alpine meadows with flowers, cows and yes, even Alphorns for us lucky fools. 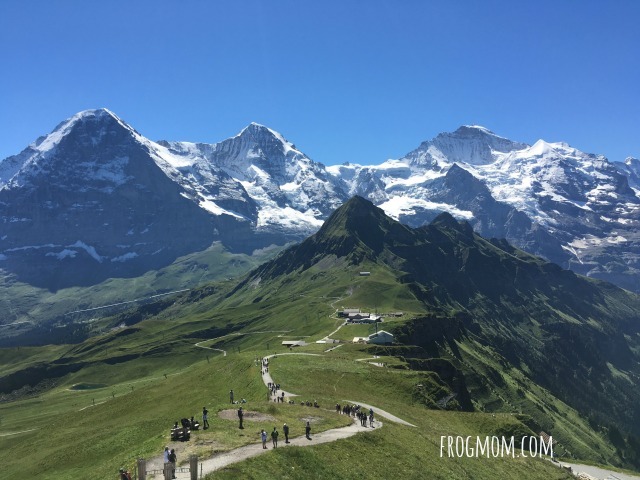 As I mentioned earlier, Jungfraujoch is the highest train station in Europe and it would have been a fun way to see the mountains from very close to the summit but at 200 Swiss Francs a pop, it was beyond our budget. To see the Eigher, the Mönch and the Jungfrau, we went the Männlichen way and I picked this entry point because of an Alphorn concert. Reaching Männlichen was almost half the fun, as the gondola ride from Grindelwald is supposedly the longest in the world at half an hour. From our gondola, we watched plump and furry marmots scramble in the meadows to their fave riverside fishing spot, which was very cute. Right at the top, we caught the tail end of the first of three Aphorn concerts that day. If you’ve never seen an Alphorn, it looks like a giant wooden pipe and has been compared to didgeridoos. 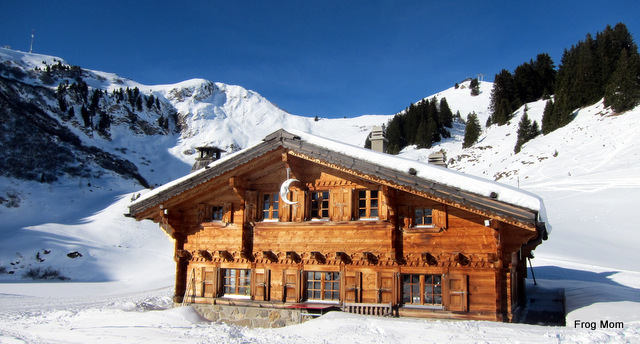 It’s the “sound of the mountains” and definitely, the Swiss national instrument. 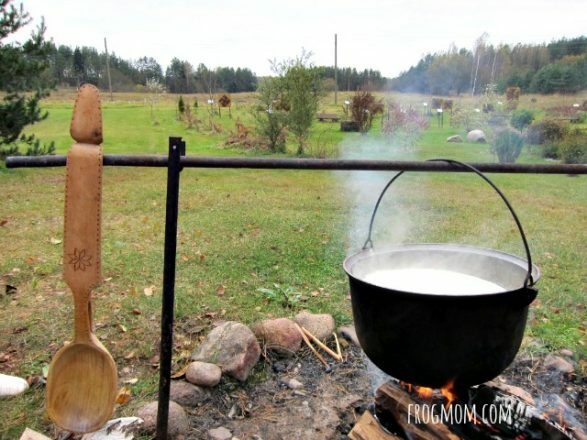 It was invented by herdsmen to communicate in the mountains and with people in the valley. 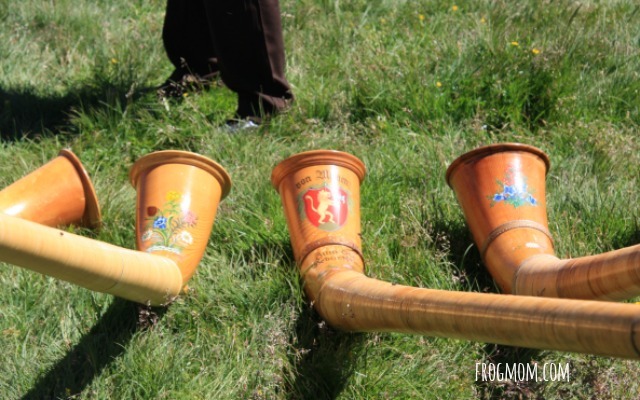 I loved how decorated each Alphorn was and how deep and smooth their sound was. Imagine when 100 of them played altogether, led by a conductor! It was an experience not unlike the Highland Games, albeit less bone-chilling but still beautifully in tune with the mountain environment. I’ll put together a video of the Alphorns so that you too can hear them. Now, what can you do from Männlichen? 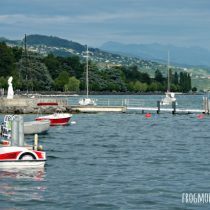 I’m suggesting two family-friendly walks from the cablecar station. If you can drag your children from the play structures around the cablecar station, the Royal Walk starts here and takes you to the 2,345 m summit in 25 leisurely minutes. 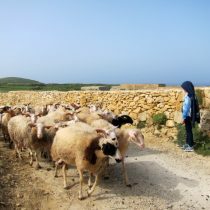 With informative signs along the way, kids can learn about what makes this world heritage site special, what types of rock the mountains are made of, or how the landscape looked as painted by a 19th century artist. It’s rather playful. Best of all, you get to learn the names of the three world-famous mountains in front of you. From left to right on this photo, they are the Eiger, the Mönch and the Jungfrau. The North face of the Eiger is so famously challenging that Clint Eastwood used the mountain as backdrop for the 1975 movie The Eiger Sanction. Once on the crown-shaped platform at the top, check out signs pointing in all directions with names of mountains and landmarks. This is the best “short” option. 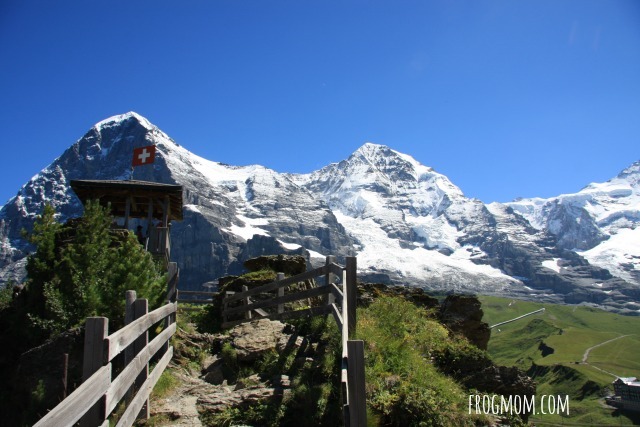 If you have a couple of hours, definitely walk to Kleine Scheidegg, the mountain pass right below the North face of the Eiger and the last train stop before the Jungfraujoch trainline makes for the snowy reaches of the mountains. It’s almost flat along 4,4 km/2,7 miles and we passed families with strollers and very young children on the way. In summer, the mountain sides are dotted with colorful wildflowers and it’s a real pleasure spotting them as you walk. At the end of the walk, we stopped at the restaurant above the mountain pass for milkshakes and fizzy water. At 2.30 pm, most people at tables were still finishing lunch and we saw mouth-watering wooden plates of cheese and cold cuts go by. Oh well, we had enjoyed a fun picnic in the meadows. 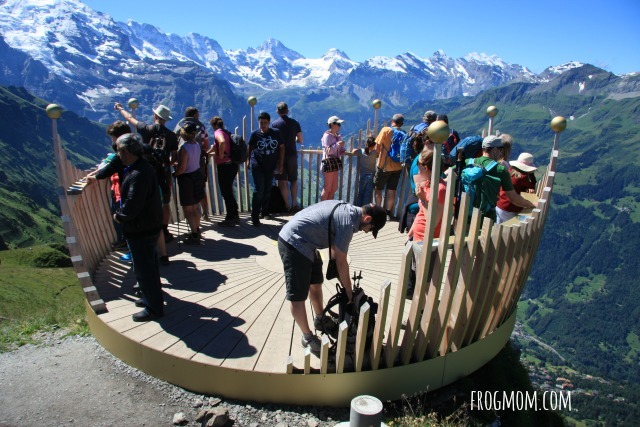 While waiting for our drinks, we all took turns climbing to the wooden lookout above Kleine Scheidegg. 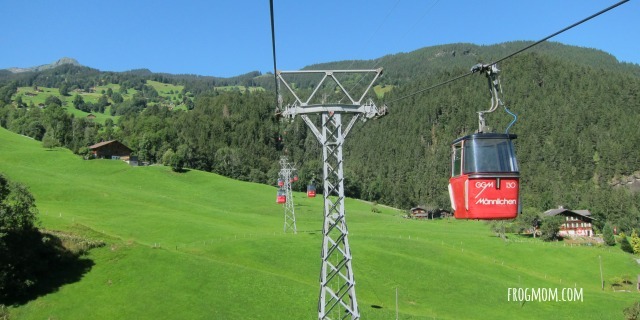 In two hours flat, we were back at the cablecar stations where the most trusted ambassadors of Swiss heritage were happily grazing in the meadows with bells around their necks. 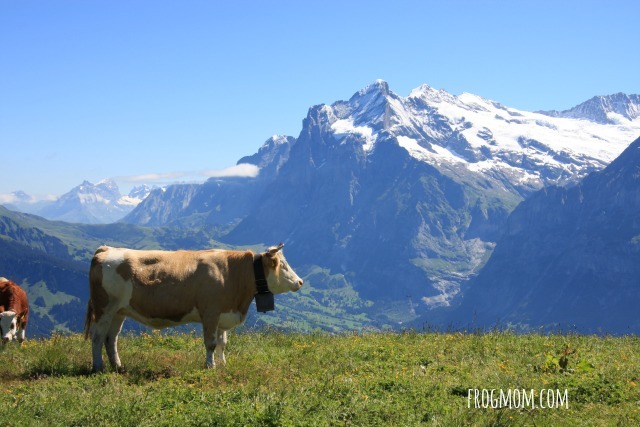 You have to give it to Swiss cows for ultimate picture-card appeal. On the way down, we spotted more marmots including a very laid-back specimen, slouching on a rock and apparently sun tanning. When even marmots are on vacation, what else can you do but enjoy? All gondola tickets can be purchased at the stations in the valley.